Summary: For a high quality exercise bike with a stunning design at a very competitive price. This is a durable, versatile bike which offers a smooth ride and a constant, precise workout. Some very positive feedback for this model – along with a large amazon.co.uk discount at the time of writing – see the latest deal over on the product page now! 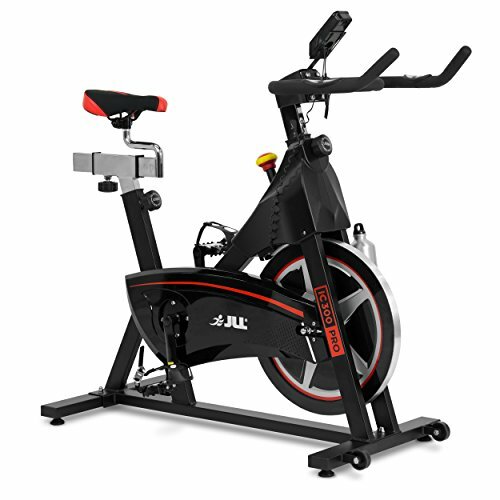 The JLL IC300 exercise bike has been designed for users at all levels of fitness, whether an absolute beginner or a serious fitness fanatic. The bike is highly adjustable, with an 18Kg flywheel and a direct chain for pedaling comfortably in both directions, simulating the sensation of riding a real bike perfectly. This bike is in the higher price range, but a huge discount at Amazon sees it priced in the lower to mid-range. The bike is ideal for users of all sizes, the handle bars with six levels of adjustability, the seat with the same and ten levels of vertical adjustment, while it is suitable for anyone up to 130kg. The bike monitor counts the time, speed, odo and calories while the heart rate sensors in the handlebars also keep track of your pulse, while an emergency stop system in also built in. A water bottle holder is very useful and they even throw in the water bottle too. In comparison with other exercise bikes in the same price range, you’ve certainly got added reliability, this assured by the 3 piece crank system on the pedals. The weighty flywheel makes this bike ideal for all users, the beginner ensured a smooth ride, while the more serious athlete will be able to push themselves that much harder, with both a constant and precise workout. The bike is compact and looks stylish too, whether in the sleek black or the eye catching white. Reviewers agree that the bike is certainly a solid and a high quality one. The assembly is said to be pretty straightforward, although it is suggested you should assemble the bike where you actually want it used. Some people have found the seat to be a little on the hard side, although this can be rectified with a more comfortable seat quickly and easily. In general, the view was that the bike was very reasonable at the price. People wanting a bike that will really push their fitness levels on will be delighted with the JLL IC300. It’s durable, is completely adjustable and gives you the real feeling of being out on the open road. This stylish looking bike will keep you focused on fitness and highly motivated. Check out the full gallery, plus the latest feedback for yourself now on this dedicated amazon.co.uk product page.